! This is NOT a method of direct communication with FLOWER BARN for purposes of ordering or rectifying problems. They care so much that you satisfied with your order. They did not have some of the flowers I wanted to fill an arrangement and they talked me through which options would look best. Super helpful and wonderful to work with. Arrangement was beautiful and recipient was very happy. Reasonably priced. The flowers were as beautiful as the picture on website and still are. Ladies at the office also loved the flowers. I'm never dissapointed with arrangements from Flower Barn. I have the satisfaction of knowing what I order will be beautifully arranged and delivered on time. I live in Texas and often send flowers to my Iowa family. Floral arrangements from Flower Barn are always fresh and beautifully arranged. Their gift items that were also delivered were top quality. They take pride in their business. Flowers were beautiful, and exactly as pictured on their website. I called to ask a couple questions, and the person was very courteous and helpful. Website was very easy to use. Will definitely use Flower Barn next time. Excellent experience! FlowerBarn always comes through when I order from Des Moines. They are prompt and courteous and well worth the money. Highly recommend!! Awesome. I ordered flowers for a funeral in Walnut, but since I was out of state, I was worried about the quality. Barry called the morning after my order to inform me that some pieces would need to be substituted and asked if that was OK. I agreed and asked him to send me pictures and he did. The arrangement was beautiful and delivered to the church prior to the visitation. I will be a customer again! Ordered Birthday Gift Basket for my son for his birthday. The website was easy to use and had a good selection to choose from. It was easy to purchase online and was at the funeral home for the funeral. I'd like to make a suggestion; labeling which plants are cat and dog friendly. It took me a bit to Google which ones I could purchase. It would just be nice to have it on the website. I ordered flowers for my sister's funeral. They were beautiful! Excellent customer service. Barry was so sweet. Thank you! I ordered these flowers for my grandma since I wasn't able to visit her and she loved them! She commented several times that they were very pretty and they lasted more than a week. Good customer service too. Thank you! The entire process was efficient and easy. The response from the company went way beyond expectations. There were substitutions made in the arrangement and it turned out beautiful! High quality flowers! All on less than 24 hr notice. Very fast and easy!! Nice job!! My flowers are as perfectly beautiful today (10 days after I received them) as the day they were given to me for my birthday! Thank you to the Flower Barn! My order was handled very professionally and even though I did not get the plant I requested I am very happy with the results. I want to thank the Flower Barn for their excellent recommendations. Fast service and the recipient LOVED the flowers! First time using this site. Very user friendly! 5 Stars. This was my first experience with this shop, so I wasn't sure what kind of service or product I was getting. Very professional staff and the flowers were beautiful. Will definitely use them again. A group of my coworkers bought a floral arrangement and balloon for a coworker who had just had surgery. The website had nice affordable options and delivery was fast. When I asked if the delivery had been made,. I received confirmation quickly. I was ordering from Missouri and found your site easy to navigate. Found exactly what I wanted, ordered it a week early and it was delivered on time in beautiful condition. Thank you! My sister loved her flowers. She sent us a picture and they were beautiful! Flowers were very very fresh and remain looking and smelling fantastic. Once again Flower Barn delivered top quality product and service!! Thanks Barry and Donna!! Easy to use website for ordering. Flowers were delivered without any known issues. I received comments about the excellent quality and size of the flower arrangement. I highly recommend Flower Barn for all of your floral needs. Barry and the staff at the Flowerbarn in Harlan are wonderful to work with and very professional! 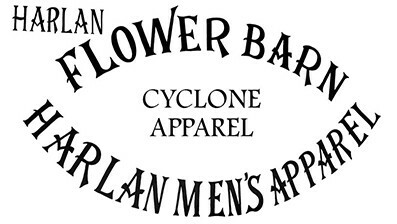 They also have a great assortment of men's dress clothes, sports team apparel (Harlan Cyclones, ISU, Iowa, UNI, and NU), plus they have gifts for memorials in addition to wonderful flower or plant arrangements. Always easy to order from out of state. Excellent job in getting an ord r after hours and ready for an early morning funeral. excellent product and delivery at very fair prices, always a good experience using them for special occasions. The flower arrangement was beautiful! I appreciated the call in advance to make sure I heard the delivery man at the door (who was quite nice, friendly, and who wished me an early Happy Mother's Day. ) I would recommend The Flower Barn to anyone! I ordered a custom order to be delivered for my girl for Valentine's Day. When she got them at her office she was in tears and the envy of the office. I was very happy with the beautiful flowers and the excellent service. Harlan flower barn will always have my patronage. Recently ordered flowers to be delivered to a friend in Harlan, who said the arrangement was absolutely gorgeous. Thank you once again, Flower Barn, for incredible flowers and excellent service. The flowers that you delivered to our aunt's funeral were beautiful, Everything that we have purchased from your flower shop has been well done. For both my father-in-laws and mother-in-laws funeral yoy have been great to workc with and very accommodating. I would highly reccommend them. You guys made my mother in-law very happy with the display you delivered, thank you. The Flower Barn is a great place to order flowers! Every time I have received or ordered flowers from The Flower Barn they have been beautiful and the flowers always last a couple of weeks. The service is always great which keeps me coming back. Once again, feedback from Iowa indicates the flower arrangement ordered for a funeral was beautiful. I can always count on Barry! I ordered a plant or arrangement for a funeral on line. I wanted something to resemble a Christmas theme, and a large evergreen like plant was sent with a red ribbon and, I believe there was also a red cardinal bird on it also. Exactly what I was wanting!!! The website was easy to use and the results were excellent. Mom loved them! Your site was user-friendly. Thank-you! I loved the plant and I liked the fact that they called first to make sure I was home before attempting the delivery. Was very pleased with the online ordering and the delivery was on time and our sister loved the flowers. The delivery was prompt and my hospitalized Aunt loved them. Much better service than I have received from other local florists in the past. Thank you!!!!!! We were not able to be at the funeral, but were told the flowers were lovely. Ordering was easy online, too. Thank you for great service! Ordering long-distance from Georgia can be uncertain, but I trust Flower Barn; all recipients in Harlan for whom I've ordered flowers of any kind have reported gorgeous long-lasting flowers. Thank you. I ordered flowers online and they were delivered within and hour! The recipient told me the flowers were beautiful and that they had never seen such gorgeous flowers! Thank you so much for making this so quick and easy! Very pretty boughet. Still nice today. It was quick and easy to order online. The flowers were delivered to the funeral and the green plant looked very nice. Thank you for the great service! Due to the weather that day, the flowers were not delivered, they were picked up. Although, the store was very good about getting ahold of me to make other arrangements for delivery, it just worked better to pick the flowers up. Ordering was very easy and selection was super. I was ordering from out of town for a funeral in town and used your services on recommendation. I was more than happy with the results. Thank you! Great Service. . Very friendly!! Very happy with the service and the flowers were beautiful! Ordering online was easy and quick. Excellent service. Thank you for rearranging the flowers. They are still very lovely. Service was absolutely top notch - I was called to confirm and let me know they had the order and would take care of it ASAP - I would do business with the Flower Barn any time - thanks! I have received flowers from the Flower Barn three times in the last few months and have been very happy with their service and with how long the flowers stayed fresh! Thank you !! Online ordering was simple and quick. I received an email confirmation. Thank you. The flowers were beautiful and the recipient LOVED them! It was easy to order online and nice to be able to see a picture of what you are getting. Good job! Thanks so much for making my wife's Valentine's Day so special since I couldn't be there myself while being deployed! We were told the bouquet was beautiful. The "thank you" we got tells us the flowers were great. My mother was thrilled with her flowers. Said it was the prettist bouguet ever. Thank you! It was quick and easy to order online. When the flowers were delivered to the funeral I was told they were even prettier in person than the picture on your website. Thank you for the great service! I got a call asking if flowers could be delivered one day earlier which was fine. Mom told me they were beautiful and then again that they were still looking good 8 days after delivery. Ordering online was simple and quick. I was contacted by phone to tell me the flowers might not be the exact ones pictured. The ones he suggested were fine and recipient was pleased and loved them. Flowers received were very beautiful and fresh. I plan to enjoy them for quite a while. Thank you. the plant is beautiful, the chocolates are already gone, the service was very good. I liked that I was given advice on caring for the plant.